Heat oven to 425°F. Place 4 (6-oz) custard cups, upside down, on cookie sheet; spray cups and sheet with cooking spray. Remove pie crusts from pouches; place flat on cutting board. With sharp knife, cut out 2 (5 1/2-inch) heart shapes from each crust. Drape each pastry heart over inverted custard cup on cookie sheet. Bake 8 to 10 minutes or until golden brown. Cool hearts on cups completely, about 30 minutes, before removing from cups. Meanwhile, with 1 1/2-inch or smaller heart-shaped canapé or cookie cutter, cut remaining scraps of dough into 12 small heart shapes; place on ungreased cookie sheet. Sprinkle with sugar. Bake 3 to 5 minutes or until light golden brown. Remove from cookie sheet; cool completely. 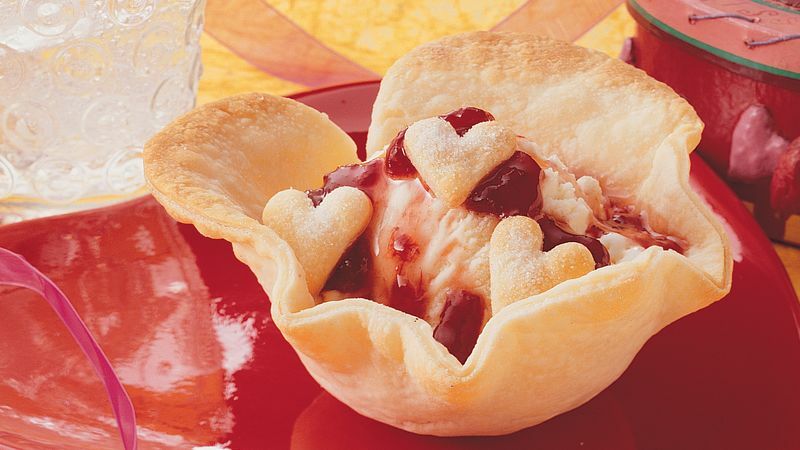 To serve, place heart cups in shallow dessert plates or bowls. Fill each with 1/2 cup ice cream. Drizzle each with 2 tablespoons strawberry topping. Top each with 3 heart cutouts. Use the extra heart sprinkles in a quick holiday snack mix with raisins and small pretzels Have a sundae bar for a party-featuring these edible cups. With remaining dough scraps, make additional hearts with canapé or cookie cutter. Sprinkle with colored sugar or mixture of sugar and cinnamon. Bake until light golden brown.